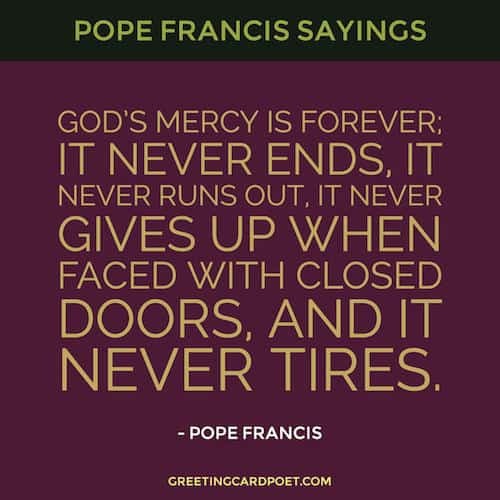 These Pope Francis quotes help provide an understanding of the leader of the Catholic Church’s positions on the poor, the church, service, mercy, forgiveness, humility, faith and love. 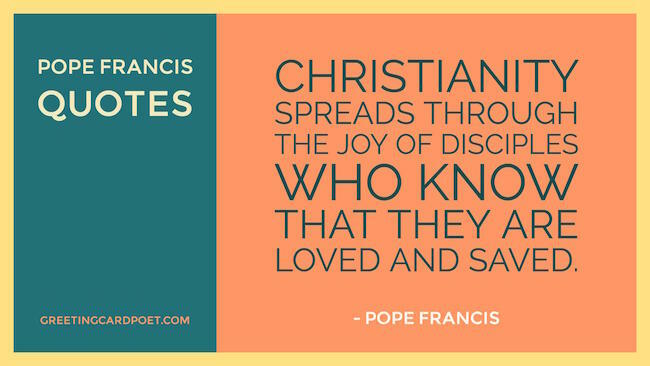 You can learn more about the church by reading these Pope Francis quotes. I believe in God, not in a Catholic God, there is no Catholic God, there is God and I believe in Jesus Christ, his incarnation. The Saints are not supermen, nor were they born perfect. When they recognized God’s love, they followed it and served others. If I can help at least one person to have a better life, that already justifies the offering of my life. I never make a judgment of a person without listening to them. I believe that I should not do this. In our talk things will come out, I will say what I think, he will say what he thinks, but I never, ever, wanted to make a judgment without hearing the person. When disciples of Christ are transparent in heart and sensitive in life, they bring the Lord’s light to the places where they live and work. The true disciple of the Lord commits himself personally to a charitable ministry whose scope is man’s multiform and endless poverty. The future of society requires the fruitful encounter between young and old. Jesus loved us. Jesus loves us. Without limit, always, to the end. 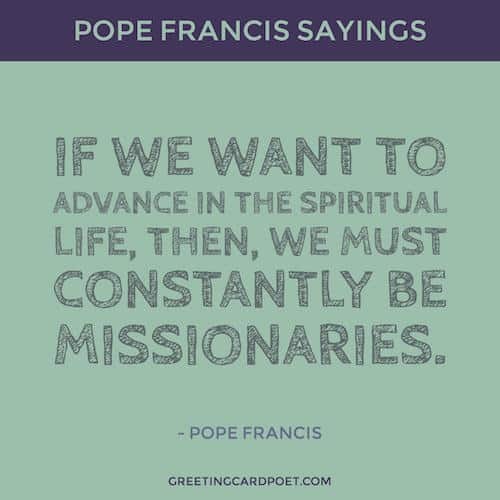 A true missionary who never ceases to be a disciple, knows Jesus walks with him speaks to him, breathes with him, works with him. Dear young people, do not be afraid of making decisive choices in life. Have faith; the Lord will not abandon you! Always there are doors that are not closed. Look for the doors that are at least a little bit open, enter and talk about common things and go on. Step by step. Peace is handcrafted. It is made every day. Only the person who feels happiness in seeking the good of others, in desiring their happiness, can be a missionary. True joy which is experienced in the family is not something random and fortuitous, but normal and ongoing. If one has the answers to all the questions — that is the proof that God is not with him. It means that he is a false prophet using religion for himself. The great leaders of the people of God, like Moses, have always left room for doubt. You must leave room for the Lord, not for our certainties; we must be humble. To form a family is to be a part of God’s dream, to join him in building a world where no one will feel alone. God is in everyone’s life. Even if the life of a person has been a disaster, even if it is destroyed by vices, drugs or anything else — God is in this person’s life. You can, you must try to seek God in every human life. Although the life of a person is a land full of thorns and weeds, there is always a space in which the good seed can grow. You have to trust God. Christ is our greatest joy; he is always at our side and will never let us down. Let us take our Christian calling seriously and commit to live as believers. Children have the right to grow up in a family with a father and mother capable of creating a suitable environment for the child’s development and emotional maturity. Today marriage and the family are in crisis. Being a believer means learning how to see with eyes of faith. Loving and forgiving are tangible and visible signs that faith has transformed our hearts. The Gospel responds to our deepest needs, since we were created for what the Gospel offers us: friendship with Jesus. More than a scientific question, the universe is a joyful mystery that speaks of God’s boundless love for us. Love is the only light which can constantly illuminate a world grown dim. The love of God is not generic. God looks with love upon every man and woman, calling them by name. Tip: You might use these Pope Francis quotes as daily affirmations, in letters and communications, or as captions. In prayer let us experience the compassion of God, full of merciful love. Jesus is more than a friend. He is a teacher of truth and life who shows us the way that leads to happiness. In the world of work today it is essential to educate and follow the luminous and demanding path of honesty. If you have any suggestions for Pope Francis quotes that would go well here, please let us know via the Contact page. Thanks. 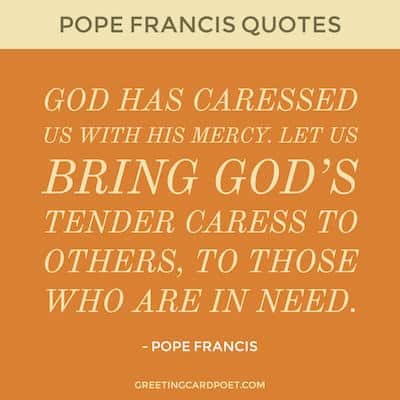 You’re on Pope Francis Quotes on Family and Life – page 1 of 2 of Pope Francis quotes and sayings.